Gold Coast Accommodation. Gold Coast Holidays & Hotel Bookings. The Gold Coast is well known for its spectacular beachfront holiday accommodation, beautiful white sandy beaches and great surf combined with convenient beachfront shopping, fine restaurants, and vibrant nightlife. The Gold Coast is popular with singles, couples and families and has a well-deserved reputation as a must see Queensland holiday destination. The nearby Gold Coast hinterland and Theme Parks are also a huge attraction to holiday visitors. Located in the south east corner of Queensland, Australia, the Gold Coast is easily accessible to most of the Australian population. 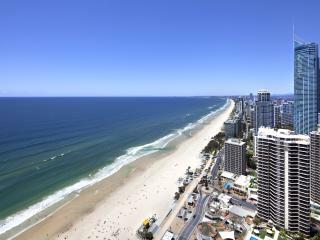 Gold Coast accommodation involves a massive range of places to stay for all styles and budgets. There are hundreds of top hotels, apartments and holiday resorts to choose from, many are found within walking distance of beautiful beaches and thriving shopping and restaurant precincts. Many of the rooms have amazing views of the ocean, hinterland or dazzling city lights and are perfectly suited to the relaxed lifestyle by the water. TravelOnline have a massive range of choices for staying at and playing on the Gold Coast with holiday package deals available to help selecting and booking the perfect holiday. The range of Gold Coast activities is long and varied. Swim in the warm ocean or laze on the beautiful beaches, shop, dine out or relax by your resort pool. Take a tour of the Gold Coast hinterland to experience world heritage listed rainforest and amazing views. World class theme parks are easily accessible from all Gold Coast accommodation and whale watching, river cruises and balloon flights are popular activities with locals, interstate visitors and tourists alike. The Gold Coast Casino and huge variety of nightclubs and bars provide excellent evening entertainment. 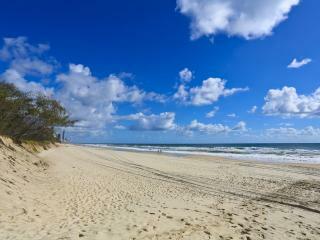 The Gold Coast weather is the main reason for the areas popularity as a holiday location. There isn't a 'bad' time to visit with winter being mild and although summer can be quite warm there is always a cool sea breeze. Sunshine is plentiful all year round and the water temperature is often perfect for swimming, surfing and other water activities. Gold Coast holiday packages are presented to help holiday travellers get the best price for their vacation. Holiday packages sometimes include accommodation along with many other travel needs such as resort vouchers, transfers, tours and activities at a cheaper package price. TravelOnline can help you with customising a holiday package to suit your needs. The Gold Coast is Australia's largest non-capital city and has hundreds of accommodation options including hotels, apartments, resorts and holiday units. The Gold Coast is just an hour by car or coach south of Brisbane. The Gold Coast consists of approximately 40 kilometres of surf beaches from Main Beach at the northern end to Coolangatta in the south.